Scarves can be worn for warmth, as cover ups in warmer months, wrapped as a halter top, wrap skirt or even as belts. Adding scarves is something I started doing a couple years back because I got introduced to accessory heaven, Charming Charlie. 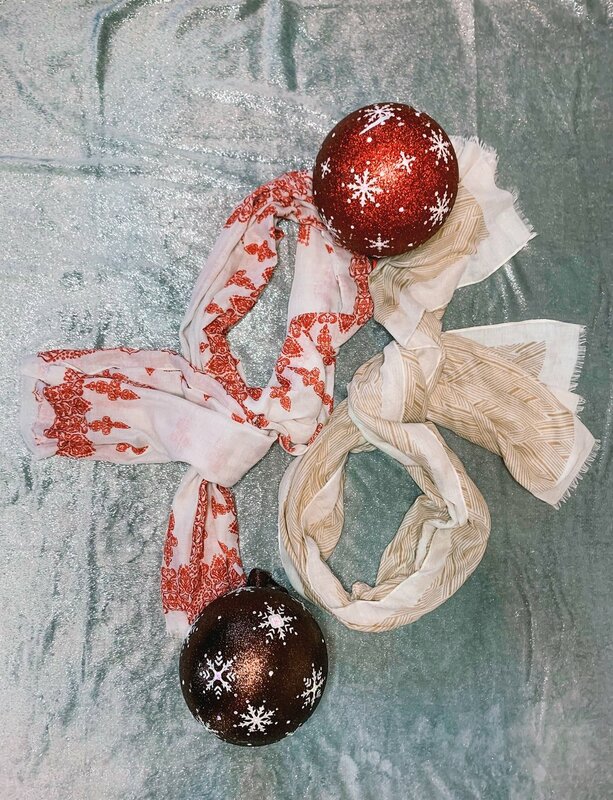 Gifting a scarf can be a great gift if you nail the persons style. I would not recommend a scarf for someone you don’t know. If you have never been in their store it is definitely a place for any kind of accessory you may be looking for. Layout is by color and theme so shopping experience is easy, yet overwhelming. Otherwise checkout their online store here to see scarf deals like 2 for $15 or 2 for $20, etc. Why do I wear scarves? Actually I wear them mainly to keep warm, but I want them to be stylish. CA cold months lend themselves to scarves and light jackets, sometime we even get cold enough for bulkier jackets. What I have noticed is that air travel during winter months gets cold as well, so I always pack a scarf for flights. Offices are also chilly spots with AC running year around, so when sitting still a scarf insulates and keeps the warmth in. Working at home I get cold sitting in one spot and throw on a scarf to warm up. When I feel a cold coming or have a cold, especially cough, a scarf around my neck helps. Infinity scarves are probably my favorite because they are super simple to wear and look good. There is no need to get creative with wrapping them. How I accessorize with a scarf? To dress up a monotone outfit. Pull together a fall/winter feel look. Add color. There are themes with scarves I pick and I love finding a pattern or unusual print. Charming Charlie really is my main source because they have a ton of choices, but I buy scarves elsewhere as I find unusual prints. 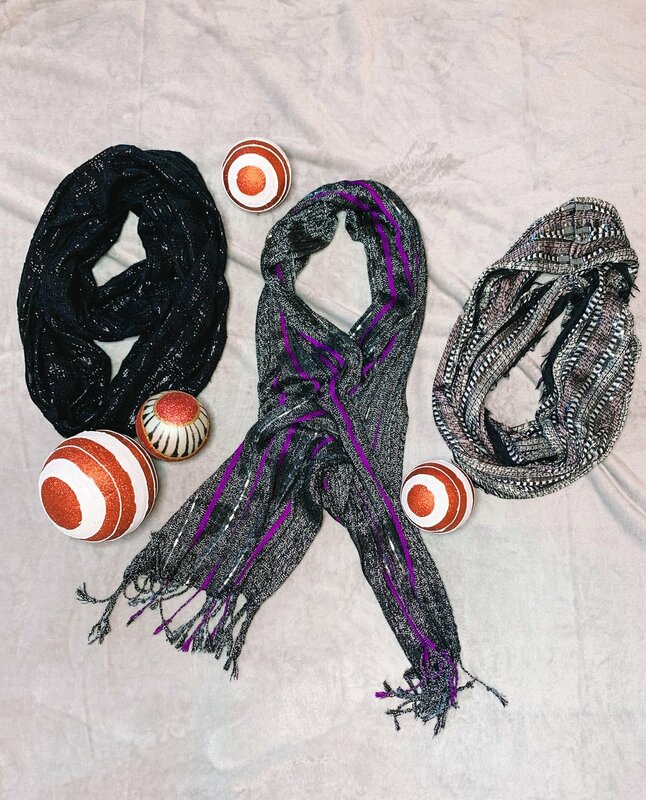 Traveling is a great time to grab scarves too. They are affordable and fun accessories to give if you know the person well. it is an accessory that always comes in handy and is useful. There are many ways to use a scarf, so you can really think about your audience and pick the right one. Charming Charlie has you covered on so many fronts, so look no further for affordable, trendy, staples and unique options. Give the gift of warmth and style. Be Awesome and Sparkle. Gift for her, or is it him? Daily Dose of Sparkle © 2017. Unauthorized use and/or duplication of this material without express and written permission from this site’s author and/or owner is strictly prohibited. Excerpts and links may be used. Provided that full and clear credit is given to Daily Dose of Sparkle with appropriate and specific direction to the original content.